Have you ever tried a new play-dough recipe? Was it everything you hoped it would be or was it an experience you never want to repeat? 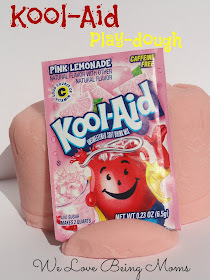 I have tried lots and lots of different play-dough recipes and been disappointed many times, I have also tried a few that were AWESOME. The problem is I can never remember which recipes worked and which turned out to be a horrible mess. 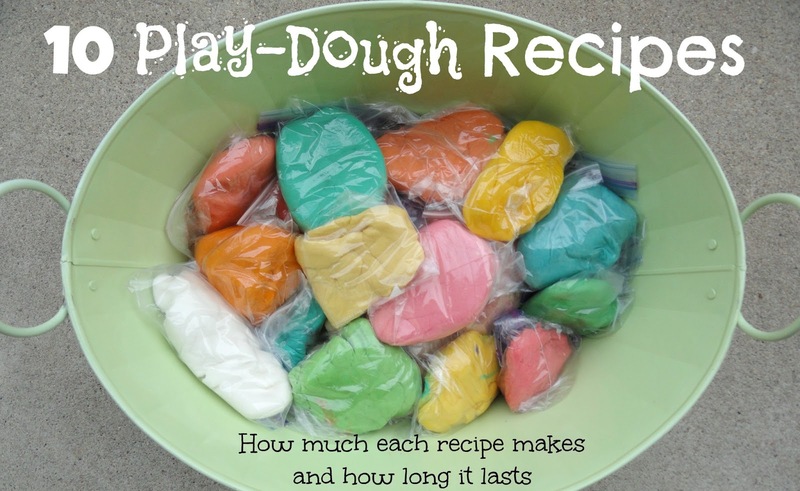 I also never know how much play-dough a recipe is going to make or how long it is going to last...it is all a HUGE guessing game. We LOVE play-dough at our house...it's my 4 year old's favorite activity and I enjoy it too so we have played this guessing game a lot. About a year ago I thought I'd found the perfect play-dough recipe online but when I made it I was very disappointed...it made a ton of play-dough and it was a crumbly mess. I decided I wasn't going to play this guessing game anymore. I decided to devote an entire day to making and playing with play-dough and recording info about each recipe. 6- Played with each play-dough at 3 weeks, 2 months, 6 months and 9 months after making it and took notes. 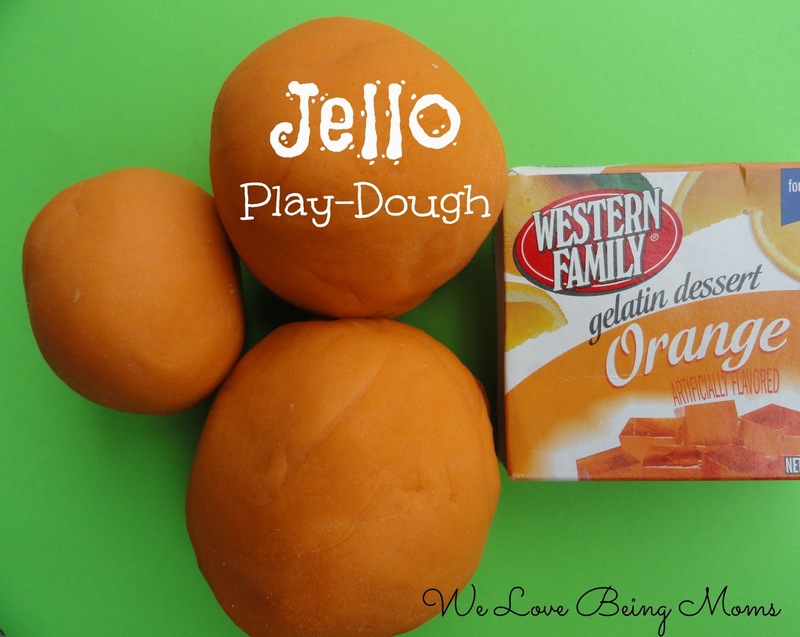 **Over the years we have tried some fun edible play-dough's. They are fun but typically a one day play-dough. They don't last long and usually end up getting eaten so we didn't experiment with any edible play-dough's. Keep or Trash? : Keep! This was by far my favorite recipe, it's just like store bought play-dough! It isn't too sticky/oily and doesn't leave a residue on hands or surface. How Long it Lasted: 9+ months (We still have it) At 6 months this play-dough was just like it was when we made it, at 9 months it was starting to crystallize a tiny bit but still great to play with. Keep or Trash: Keep! This is a good play-dough and makes a ton. It does leave a very slight white residue on hands and surface. How Long it Lasted: 9+ months. At 6 months it crystallized slightly, by 9 months it was a little dry but still good to play with. Keep or Trash: Keep! This was a great recipe but did become sticky overtime. How Long it Lasted: 9+ months. This recipe became sticky at 6 months but it was still okay to play with...just a little messy. Keep or Trash: Keep! This smells really good for the first week but then the smell wears off. It also stores well without having to be refrigerated. How Long it Lasted: 9 + months. After about 3 months it is a little sticky and leaves a slight white residue but is still great to play with. Keep or Trash: Keep. This was a good one time play-dough although it doesn't last long. How Long it Lasted: At 2 weeks it had become really sticky. Mix with hands in bowl, knead. Keep or Trash: Trash, it worked but was not a very good play-dough. How Long it Lasted: At 3 weeks it was a little watery, at 2 months the oil had surfaced and it was very sticky. Keep or Trash: Trash. This could be a good alternative to flour recipes, but it's not a great play-dough. How Long it Lasted: 3 Weeks. At 2 Months it had separated and was not good to play with. Keep or Trash: Trash. This would be an alright one timer but I won't be making it again. How Long it Lasted: Molded in 3 weeks. Keep or Trash: Trash, way to crumbly. How Long it Lasted: This was really crumbly in the beginning but we held on to it for 2 months to see if it got better. At 2 months the oil came to the surface and it was sticky but still crumbled like crazy. Keep or Trash: Trash, Molded in 4 days. How Long it Lasted: 4 days. 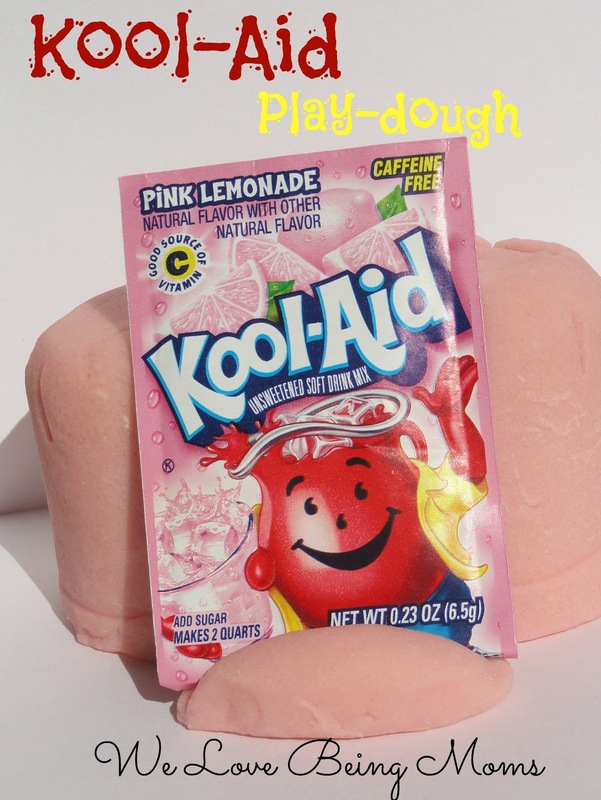 This play-dough was fine (sticky) for a one-time use but did not store well at all. ~Cream of Tarter really helps the dough stay together. ~Don't add a lot of salt...it dries the dough out. ~Their are all sorts of ways to make play-dough: Cooking it over the stove: adding hot water to the dry ingredients and no-cook recipes. 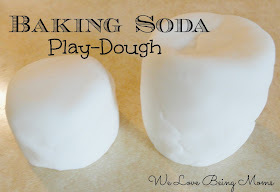 If you are looking for a store bought like play-dough that stays together well and doesn't have visible grains of salt you are most likely going to use a recipe that requires cooking it over the stove. Others are easier to make but don't turn out as well. 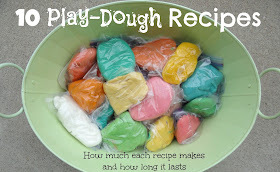 ~Play-dough is best stored in plastic Ziploc bags that seal well. We experimented with storing it in containers and plastic bags and the play-dough in the bags stayed better longer...it didn't dry out as fast. Wondering what to do with your play-dough now that you have a great recipe? 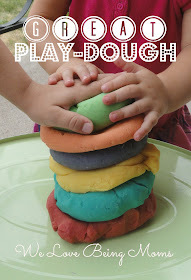 Click the link below for some fun play-dough activities. Thanks for doing all the research for us! I thought I had a great recipe from teaching preschool but I am excited to try your favorite! I appreciate this sooo much! Wow! Thanks! I am also tired of searching for a great play doh recipe. You described everything so well! Excellent job! Thanks for the recipes. Can't wait to try them out! Can i confirm that 1 T = Tablespoon? ; 1 t = teaspoon? Did you use table salt or kosher salt? I found this via Pinterest, i tried the first recepie, and it's AWESOME! Only i used lemon juice instead of cream of tartar (we do not have that in my country).